The Roaring 1920s in America were happy-go-lucky days of wild times, illegal speakeasies and dances like the Jitterbug and the Charleston. But fueling all that crazy joy was a stock market bubble that ended, as we know now, in the Great Depression. But before the market crash of 1929, most U.S. cities were seeing a huge explosion in growth and building. 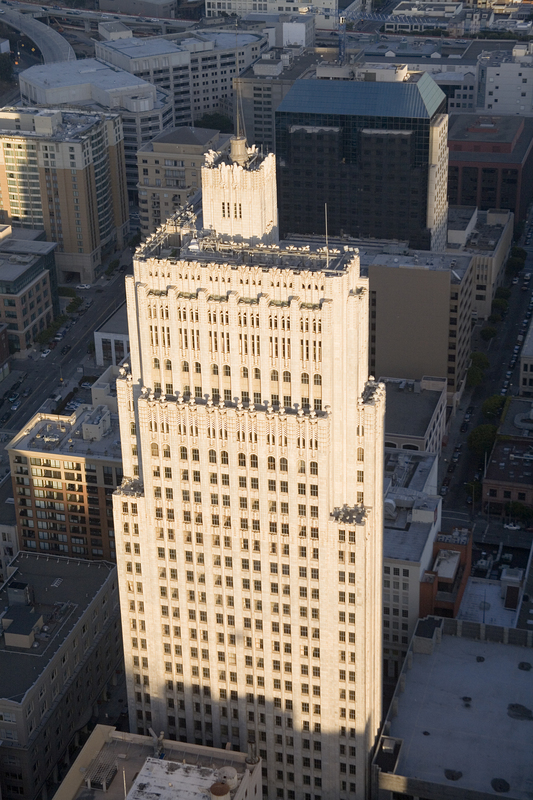 In San Francisco, major corporations started to build their first real high-rise skyscrapers, with Timothy Pflueger’s Pacific Telephone Building leading the way. Hollywood also got into the act, with exotic movies and palaces to match, in many big cities. Locally, theatres popped up everywhere, from the big Market Street houses like the Loews Warfield and the Golden Gate theatres, both designed by architect Albert Lansburgh and completed in 1922. There were even smaller neighborhood movie palaces, such as the Castro Theatre, one of Pflueger’s first big projects as a licensed architect. It was also a time of further neighborhood development, such as the creation of Balboa Terrace from 1920-1927, adding to other neighborhoods in the western reaches of the city, like St. Francis Wood, begun in 1914. These developments offered families detached houses, often designed in the Spanish Colonial revival, Mediterranean, or English cottage styles. Fellow San Francisco City Guide and author Jacquie Proctor has written an excellent book about English architect Harold Stoner, who designed many homes in Balboa Terrace and other neighborhoods west of Twin Peaks, some in the storybook style, with lovely details, ironwork, woodwork, yards and more room than in the typically congested San Francisco neighborhood. There were plenty of others, however, single people or couples without children, who wanted to live closer to their jobs, or to the city’s hubbub. So a few architects became the go-to designers of apartment buildings in the most glamorous styles, some with the set-back skyscraper form seen in the cities of New York, Chicago and San Francisco. Pflueger was not among this group, but one can see how some of his work and influenced this group of SF apartment builders. This post is the first in a series of mini-bios on some of the architects, whose work is familiar to many in the city, but not much is known about the architects themselves. Herman Carl Baumann, also known as H.C. Baumann, or “Mike” is known as one of the most prolific architects in San Francisco. 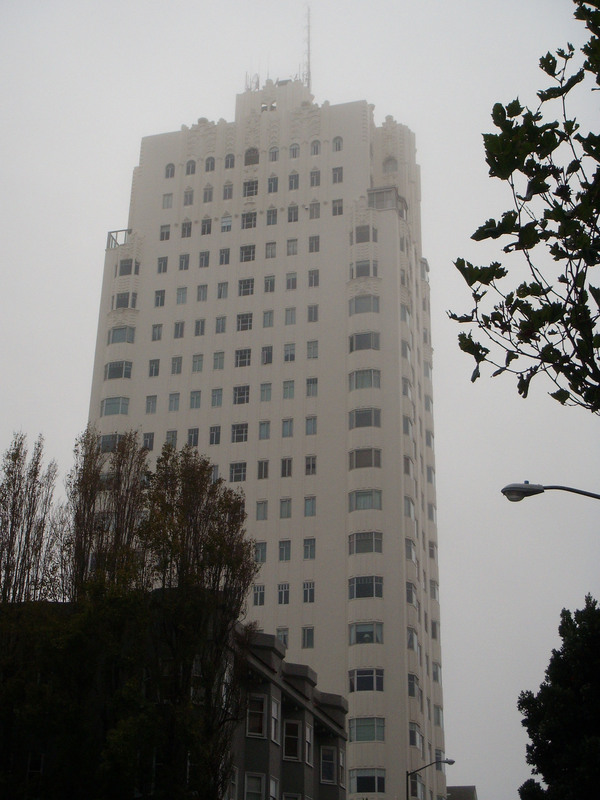 He designed over 400 apartment buildings in the Bay Area, some of the most elegant high-rise buildings in Pacific Heights, Russian Hill, the Marina and Oakland. Baumann, like his contemporary Pflueger, was born of German immigrant parents, on April 13, 1890 in Oakland. His family moved to San Francisco one year later to the Potrero Hill district. His stepfather worked as a brick mason which may have inspired Baumann to pursue architecture. He also became a member of the San Francisco Architectural Club, where he studied in an atelier patterned after the methods used at the Ecole des Beaux-Arts in Paris, and made important connections for the future. Since Pflueger was also a young draftsman who reinforced his office training with classes at the S.F.A.C., and they were two years apart, it seems likely that Baumann and Pflueger knew each other at an early age. 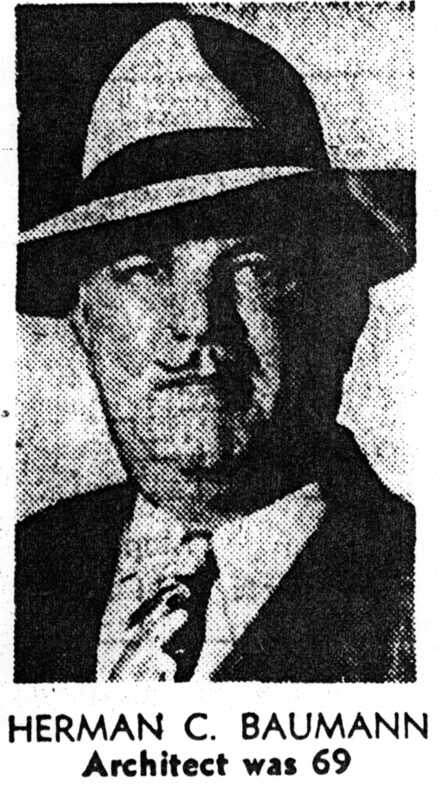 Bauman received his California architectural license in 1921, one year after Pflueger received his license. Baumann began working as a draftsman in 1905 for Thomas Edwards at age 15, receiving much of his training in the office. He first appears in San Francisco City Directories after the earthquake, as a draftsman in 1907. From 1911 to 1912, he listed architect Norman W. Sexton as his employer. In 1915, Baumann describes himself as an architect, six years before he got his state license. He worked for contractor George Wagner Construction for at least a year in 1919. 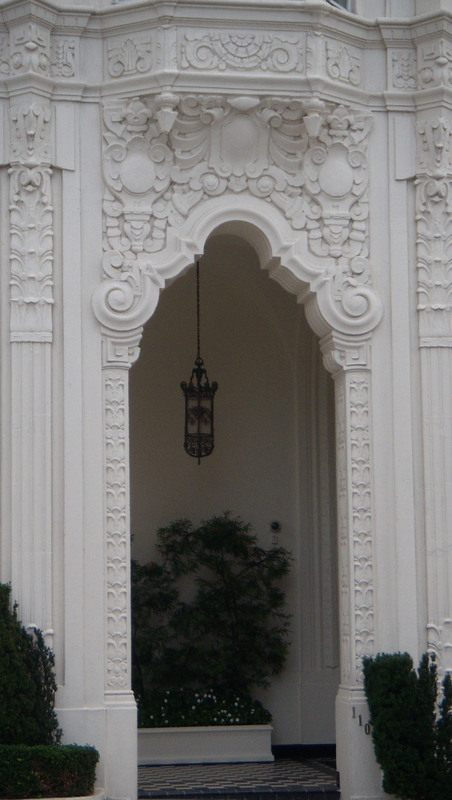 Wagner also had ties to the SF architectural club: he was one of its founding members in 1901. By 1920, Baumann was on his own, in the same building as Wagner, at 251 Kearny on the corner of Bush, a Renaissance Revival style building designed by Albert Pissis that also housed other architects, including Arthur Brown, Jr.
Baumann had an eclectic style, adding touches of everything from to Spanish Colonial Revival to the Churrigueresque to Zigzag Deco. One of his most famous apartment houses was the Bellaire, at 1101 Green Street, a building that he financed himself during the late 1920s, and would lead to his financial ruin in the 1930s. He invested almost everything he had into the Bellaire, a luxury apartment house, now condominiums, that recalls the Telephone Building with its setbacks and vertical emphasis. Before the Bellaire, for a few years in the 1920s, Baumann was in a partnership with Edward Jose, a builder. The January, 1924 issue of The Architect and Engineer had a 16-page feature on the partners with photos of many of their earlier apartment houses and homes. “There is a refreshing absence of the stereotyped four walls and uninteresting entrances in the apartments here illustrated,” A&E wrote. The article also noted that in previous apartment buildings in the city, there was a tendency to crowd too many rooms. 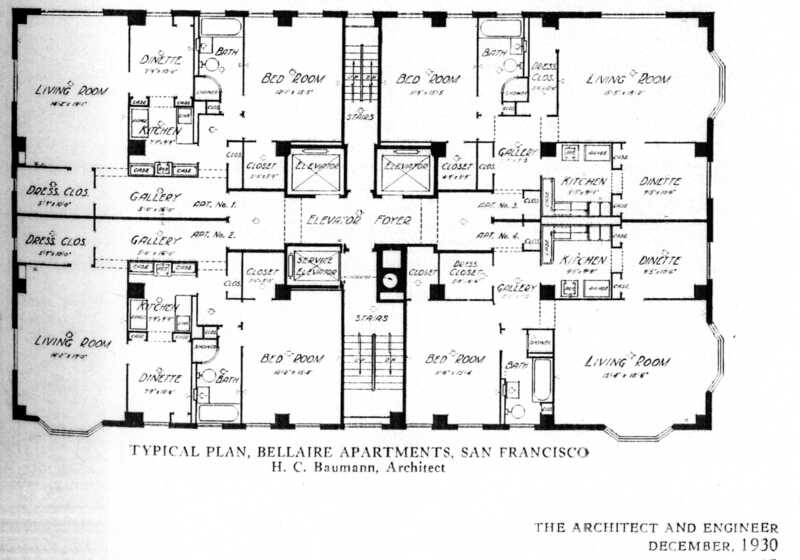 “The experience of Messrs. Baumann and Jose has been that fewer rooms on a floor, with plenty of ventilation, will command higher rental than narrow hallways and court apartments possessing limited ventilation and light.” Baumann embraced this philosophy throughout his career, as the floorplan for the Bellaire shows. Another one of Baumann’s best-known Bay Area buildings, now a condominium tower, is the 15-story Bellevue-Staten on Lake Merritt in Oakland, listed on the National Register of Historic Places since 1991. The Bellevue-Staten, completed in 1929 was “the last word in ultra-modern home apartment construction,” according to ads placed when it opened. Four photos of the exuberant Bellevue-Staten, a Deco-Baroque take on the Spanish Colonial Revival style, appeared in December, 1930 issue of the Architect and Engineer. A one-bedroom unit went on sale last year, and the photos in this Chronicle story show many of the interior features: original parquet floors, fireplace with original detailing, a turquoise-tiled bathroom, and a Moorish-like original lobby. His vast portfolio is too large to recount, but realtor David Parry of McGuire Real Estate offers an account here listing many more of his buildings. Like Pflueger, near the end of his career (Baumann lived a lot longer, however, dying in 1960, just shy of his 70th birthday), he moved towards modernism. His last building is the high-rise at 1800 Pacific Avenue at Broadway, with lots of big glass windows, small balconies and dark rock surfacing, although his interpretation of the International Style is not as successful as his earlier work.